White Chocolate Raspberry — Sugarfuse! This is a one-night class where we'll have fun making an 8" Sugarfuse! White Chocolate Raspberry cake for you to take home and enjoy. It's so much fun pouring the white chocolate ganache on this cake! 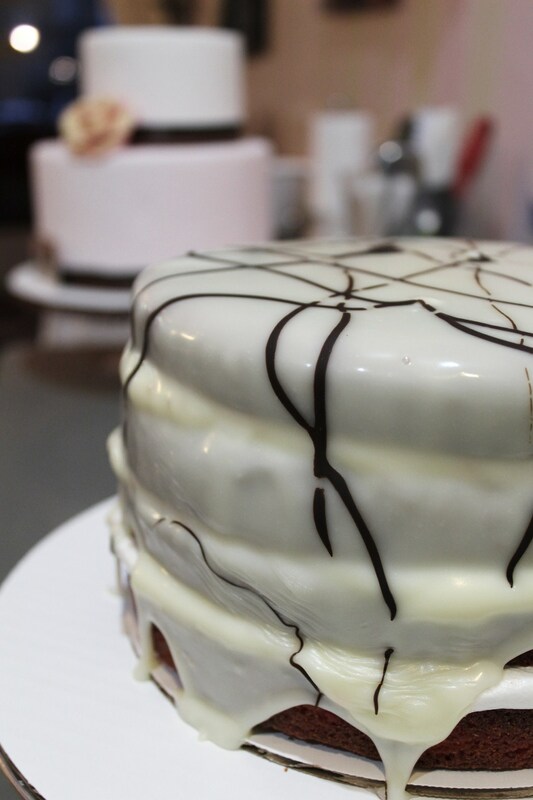 We provide the cake, filling, ganache, and chocolate. Just bring yourself --- and maybe a friend! While we cover a number of cake decorating techniques, this fun class emphasizes what an enjoyable hobby cake decorating can be. It's a perfect starting point for someone who enjoys baking, decorating, or just eating an award-winning cake! During this fun night out, you'll learn some basics about cake stacking and leveling, piping, proper whipped-filling consistency, how to make white chocolate ganache, and work with real chocolate. The class ends with you taking home a remarkably delicious cake. This one-night class makes for the perfect gift or a fun night out with your friends!